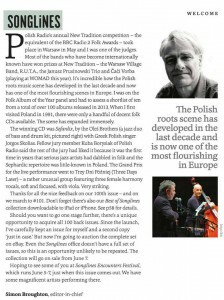 An album of the trio Oles Brothers & Jorgos Skolias titled SEFARDIX has been chosen as the Best Album of 2013 in Poland by the Polish Radio’s Festival called A New Tradition. An international jury of Simon Broughton (Songlines Magazine), Bartek Chacinski (Polityka), Jacek Hawryluk (vice-president of Program 2 Polish Radio), Johanes Theurer (World Music Charts Europe) and Kuba Borysiak (Program 2 Polish Radio) has selected this album among 40 others. Mediterranean culture contexts – it was the inspiration of outstanding project SEFARDIX created by THE OLES BROTHERS and JORGOS SKOLIAS (Poland). 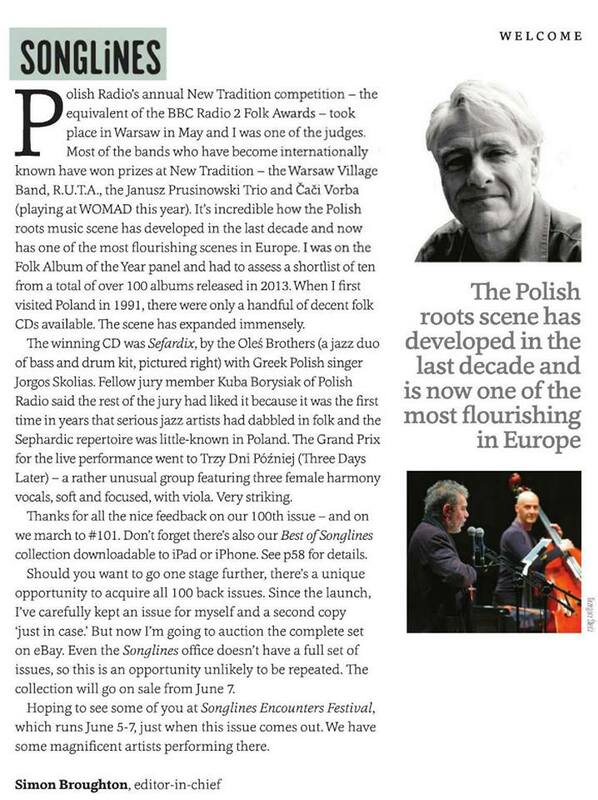 Immediately after release (2014) SEFARDIX got excellent reviews and was honoured with Polish Radio’s „Folk Phonogram of the Year Award” – the most important distinction in Polish folk industry. This groundbreaking album is the opening of a new stylistic space, combining signs of ethnic inspirations and the virtuosity and innovation jazz value. SEFARDIX is groundbreaking, innovative, disintegrating convention of classification of the genres.